When David Moyes makes the long walk down the Old Trafford tunnel on Wednesday evening he will step out on to the pitch to the warm applause of 72,000 supportive, yet slightly dubious Mancunians, who despite a string of improved results are still unsure of what to make of their new boss. But what will be the reaction of the travelling Everton contingent away to his right? Will he receive the acclaim his 11 year stint in charge of the Blues richly deserves, or will his disrespectful treatment of Everton since his departure result in a chorus of booing and jeering? It is hard to argue with David Moyes’ impact at Everton. He took over a team who had become perennial relegation candidates and transformed them to an established top seven team, one who would regularly compete for a place in Europe and for one season upset the status quo and secure the coveted fourth place finish and a shot at the Champions League. During his time on Merseyside, Everton became the top team in Liverpool, finishing above the Reds in each of the last two campaigns, a quite unbelievable achievement when comparing financial resources. In a difficult economic time, Moyes brought stability to Goodison, enabling the Blues to progress, but disappointingly he was unable to end the trophy drought which has now extended to 19 years. Despite leaving Everton in a far better position than when he arrived at the club, the opening months of the new season would suggest that Moyes outstayed his effectiveness at Goodison. The club had become stale, with Everton failing to make significant progress since 2008-09. That season Everton were incredibly unfortunate to lose in the FA Cup Final to Chelsea and finished a highly respectable fifth in the Premier League, however since that date at Wembley, the club have stagnated, finishing, eighth, seventh, seventh and sixth. David Moyes adopted a very structured tactical approach, with each player knowing exactly what was expected of them on the football pitch. The players were and I am sure it is the same at Old Trafford, expected to follow the manager’s instructions to the letter. The great Dynamo Kiev manager, Valery Lobanovsky employed a football by numbers tactical approach, a theory endorsed by Moyes as he looked to control every element of his teams display. Moyes was very much the puppet master, with his players operating on strings. In contrast, Roberto Martinez allows his players the freedom to express themselves. Football is to be enjoyed and his players are certainly playing with flair and exuberance. It is hard to imagine an Everton side featuring Barkley, Mirallas and Deulofeu would have ever taken to the field under the watchful and critical eye of Moyes. But Martinez is positively encouraging this approach, Everton retain the ball superbly, but can attack with pace and above all look to win every match. The Spaniards in-game management is exceptional and his ability to react to what is happening on the pitch in front of him has already earned Everton points that would have been lost previously (West Ham, Hull, Villa, Liverpool). Under Moyes, Everton failed to win away at either Manchester United, Arsenal, Chelsea or Liverpool. The Blues would arrive at the grounds of the “Sky Four” and be beaten before they had stepped onto the pitch. The negativity stemmed from the top, with Moyes admitting that “You want to get out of Old Trafford alive, that was our saying.” That approach should never be accepted by a football club with a history as proud as Everton. Roberto Martinez has instantly recognised the need to change the player’s mentality. “If you are going to be brave and try to win games rather than just being in a position where you want to keep a clean sheet and get through in damage-limitation situations, then you need to be flexible as a player and as a team and play in different ways in the modern game. That is the attitude we have had from the beginning. We have had one defeat in 13. 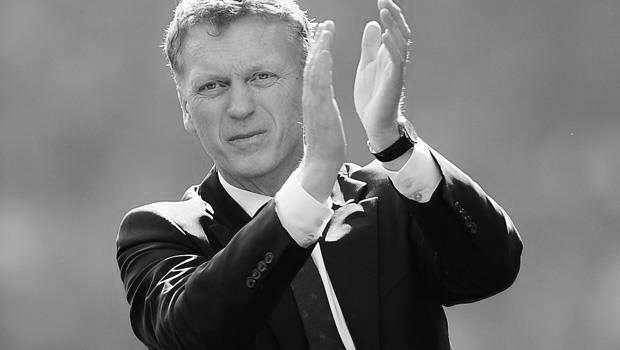 On his appointment at Old Trafford, David Moyes was praised for his handling of young players. Wayne Rooney, James Vaughan, Victor Anichebe and Jack Rodwell were all given opportunities to establish themselves as first team players during Moyes tenure in charge, but he certainly lost faith in young players as his Everton career progressed. Ross Barkley is an exceptional talent, but rather than encourage the teenager, Barkley was publicly chastised for making a mistake at Blackburn and very rarely appeared in the team again during Moyes’ remaining two years at the club. If Everton are to progress, it is players like Barkley who must be encouraged. Roberto Martinez instantly recognised that and has put his faith in the young Evertonian, accepting that on occasions he will make a mistake, but knowing the return will far outweigh the level of risk. David Moyes’ public comments and levels of hypocrisy since leaving the club have upset many, but he did enough in his time at Everton to earn the respect of every Blue. Martinez has been keen to downplay any bad feeling towards his predecessor in his press conference this week, explaining that Moyes’ actions in the summer were not out-of-place in the footballing world. I fear the overwhelming feeling towards Moyes will be one of resentment and I understand that. I have used this platform to direct my anger at the former Everton manager since his departure, but I believe he deserves a warm round of applause from the Everton support before his team are played off the pitch by Martinez’ new and improved Everton. I was always a big supporter of David Moyes and I was devastated by his departure to Old Trafford, but on reflection and having had opportunity to experience the early days of the Martinez era, I would argue that Moyes should have left Everton much earlier. By the end of the 2008-09 season he had achieved all he was capable of at Everton and a fresh approach was required to take the club forward. We certainly have the right man in charge for the next stage in the clubs evolution and Everton, whatever the result on Wednesday night will go on to bigger and better things under Roberto Martinez. Next Post Do you want to write for our Everton website?